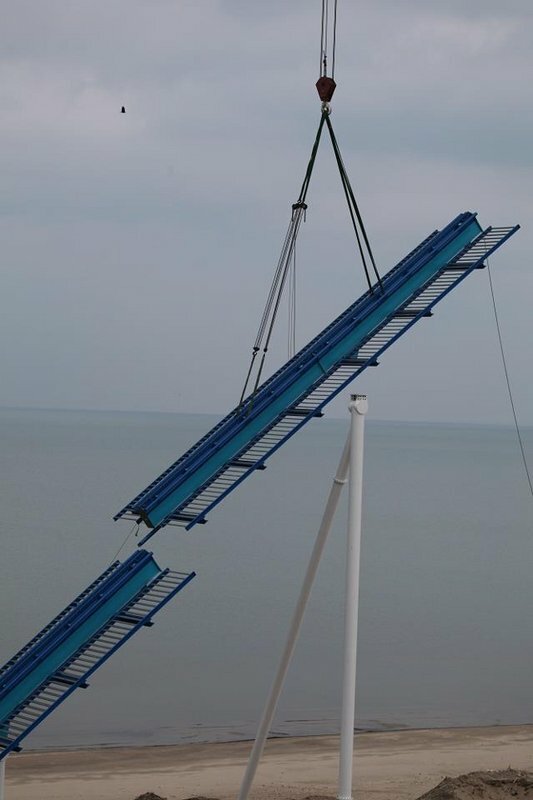 Not exactly anything to fap over yet but here are the first sections of "Gatekeeper" track arriving, courtesy of Cedar Points Facebook page. Cedar Point didn't exactly hang about with this one. This is looking good, another fine B&M for the Point. Cp's coaster collection is growing evermore impressive. Truly the "Roller Coaster Capitol of the World!" The lift hill is about 1/2 up. Hey Chikara! I'm really looking forward to GateKeeper too (easily beats most other 2013 projects; probably tying with SW7 and Outlaw Run for me). I can't wait to see the entrance gate flyer-over lifted into place! Why not become a member on the Forums and join in the chat everywhere? Timelapse, Looking like the view from the car park will be growing ever nicer! Great! I'm (obviously) excited to see the park get another world class beemer. Raptor is what set the way for most of the following Inverts, hopefully, GateKeeper will do the same. The layout is a simple out-and-back, yet it gives the illusion of being something else, and it doesn't even seem like an out-and-back. Truly a unique fit for the point, this is shaping up to be a excellent coaster. Well as we most of us probably know Gatekeeper has been topped off now! I'm in love with these two images! Also The bottom of the drop has been started, looking very similar to Swarms construction! Subtle shun towards towers! 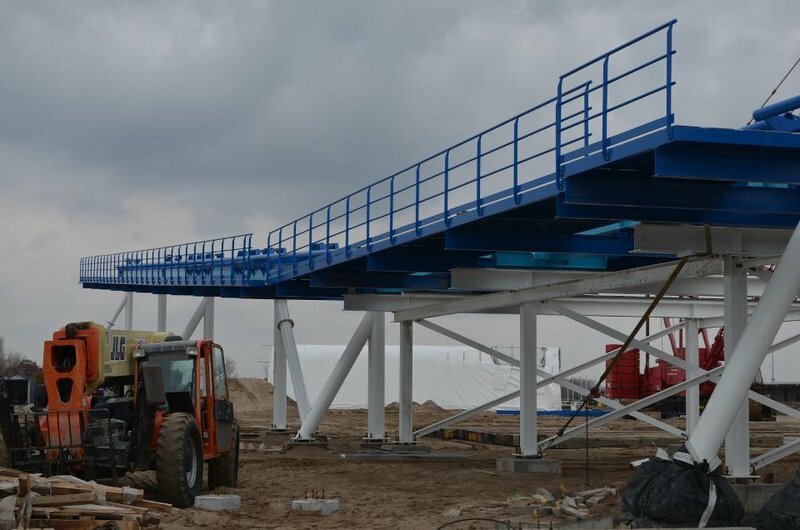 Cedar Point are further into their construction than SW7 and is due to open 2 months after in May 2013! Certainly the most interesting looking wing coaster so far. Wild Eagle was nice, X-flight was fun, and Raptor looks to be awesome. However, the Swarm looks like the least interesting one, very short and slow. Just my opinion. Before riding I thought the same but The Swarm is a lot better (faster) than it looks, if a little short. It is near impossible to tell from POVs but X-flight looks to be the weakest one to me with the a poorer initial inversion, some awkward looking manoeuvres and pacing. Wild Eagle looks by some way the best so far, and GateKeeper should be even better if what we've seen in mock ups is accurate. One of the most exciting elements here for me will be the gate cut throughs. The near misses don't seem to have quite worked out so far, but the shear speed these will be taken at should make it quite a feeling. One of the most exciting elements here for me will be the gate cut troughs The near misses don't seem to have quite worked out so far, but the shear speed these will be taken at should make it quite a feeling. I do agree that the Keyhole towers will be the highlight of the ride, seeing how this this is going to be able to keep it's speed, should be great. Forgive me if I'm wrong doesn't The Swarm have a Zero G roll? The Second inversion, no? The Swarms dive drop is more horizontal than X-Flights making it slightly more exhilarating. The swarm has 3/4's of a helix after the trim to be fair. In my opinion They are nothing alike. Edit: "Other than being mirrored the only differences are: Swarm has a Inclined loop, X-flight has an Immelman, and X-flight has helix after the inline roll. And I do find them very alike. Very minimal difference. Both cookie-cutter beemers, and both are still great for what they do. How you get that after riding The Swarm only I have no idea. Don't really get how both rides are cookie cutters here. It's not like the wing-rider has a particular style yet. When 14 Six Flag parks have X-Flight clones, I shall agree with you but until that moment, the wing-rider is as close to B&M originality as you can get. The drop is close to being topped off, with just the twist to be put into place! Which can be seen in one of my other posts on this page on the time lapse image. Here is a second & closer webcam. Possibly to give other wing riders a run for their money, however it does come down to several aspects. Other wing riders may be short but thrilling nonetheless with an immense indulge in theming. So potentially as a coaster it could beat other wing riders but experience wise it may lack. What is with the idea that longer coasters are automatically better than shorter ones? This looks to be classic B&M design, the forces are going to be there, that much I can already tell. It's really the most impressive beemer I've seen since Sheikra. This just looks amazing! Out of interest, what B&M's have you ridden. Awkward, I didn't mean longer are better! Some short coasters are brilliant whilst longer coasters can sometimes get boring towards the end. For me it's the experience it delivers in the length rather than the length in the experience. Exactly. As long as the ride experience is good and memorable. Some coasters are superb, but seem really dragged out (Voyage). But that's also what makes them so great, a relentless action packed ride is something every park should look into. Love how these pictures are actually just copied pasted from the live webcams. Was wondering why all I could see was pitch blackness most times when I view them! GateKeeper is another fantastic addition to the Cedar Point skyline!